me neather sometimes,to much little parts that i made ready and later i dont know if i made them ,or just made new ones,and found out later that i already made them. 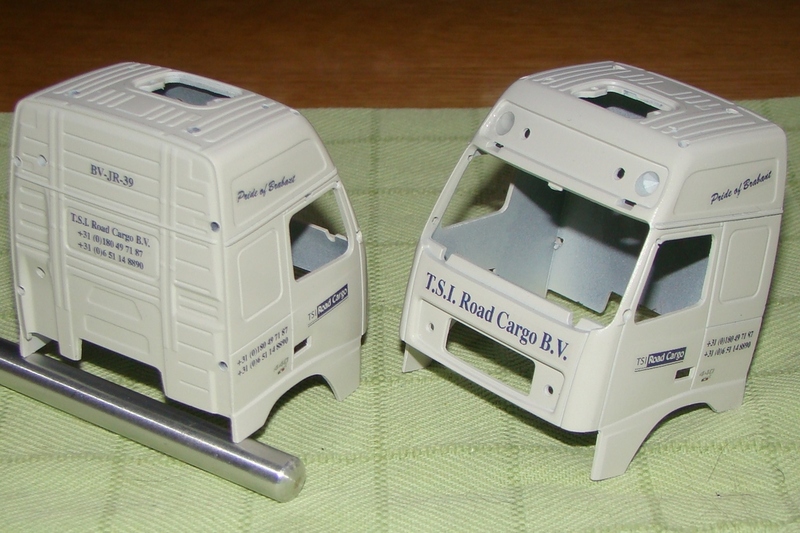 for the models i know which trailer behind wich truck belongs,but now in this case, i had them in a cartonbox,and just take them al,they are all onsprayed,so al the same. this week i noticed my mistake,when i take the bumpers out of a jar i thought that i messed one,juust a few seconds later i wake up,and realise what i have done. Then why on earth didn't you say you wanted to make a Jac.H. Kool truck as well. You give only half the information and you expect everyone to know what you're talking about. BAH! You'll never get started on that Mammoet Western Star at this rate. Adrian, you know our English expression "talking double Dutch"? Well, now we know why. Maybe this is double English. I don't know, is that better, worse or about the same as double Dutch? It seems we will end up with a Kool-Renault-Trailer-Brinor-Bumbers-Truck .... in a Jar, like a ship in a bottle. The real problem is me, not your English Thijs. I need to go back and read everything again. you see the 3 yellow trailer sides with the 3 red trucks,beside them 1 red sheet and a grey truck thats the one. 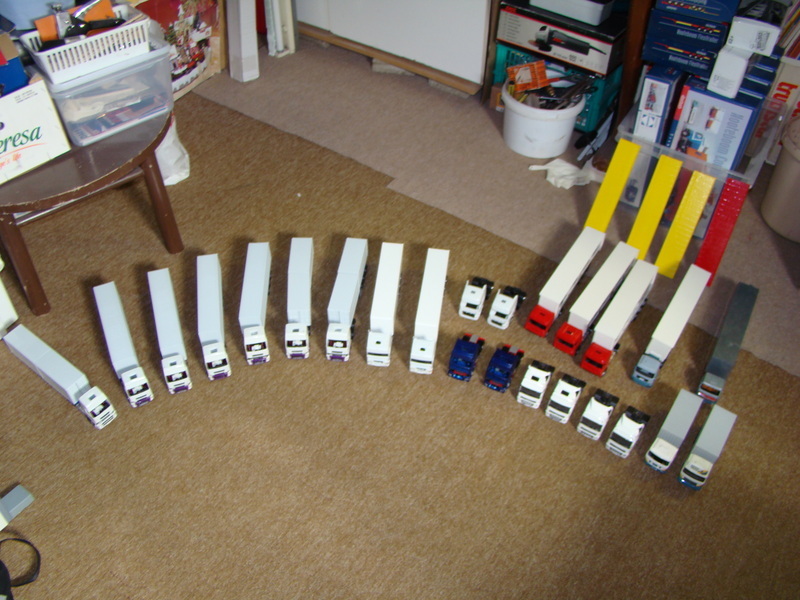 al models onthe frist row are fiished and gone exept the 2 most right trucks. if i have to take those what i'm working at or planning to build,then there wil be a whole new row. i'm not dooing anything with the westeren star Ivy. 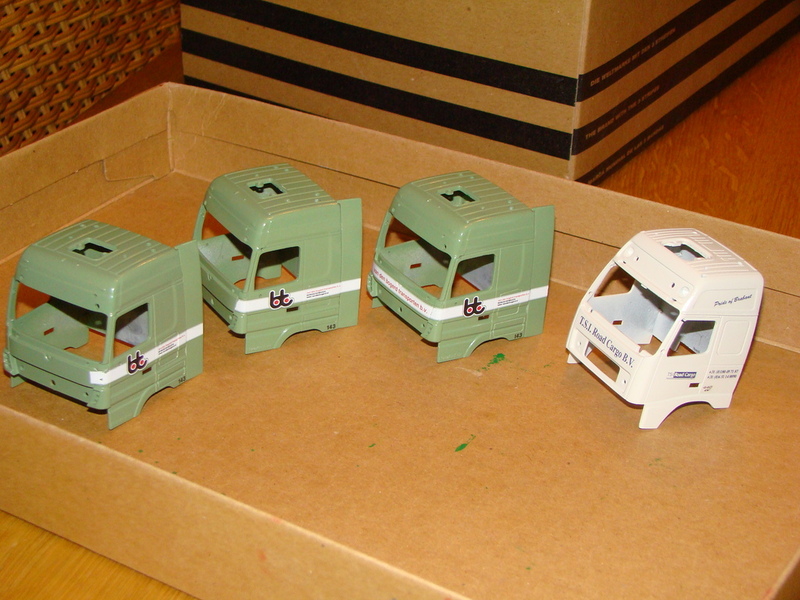 it's a complete model,and there are no kits for sale too,i just like the american truck style. Thijs, with the masses of very small parts that you often show laid out ready for action, or in various stages of the work, I'm always impressed by the way that you have it all so well organised, and your patience in getting the smallest detail correct. The results always look good. And that is proved by the requests you get from others to make them a model. Plenty kudos to you! So don't get bothered by the occasional mix-up. 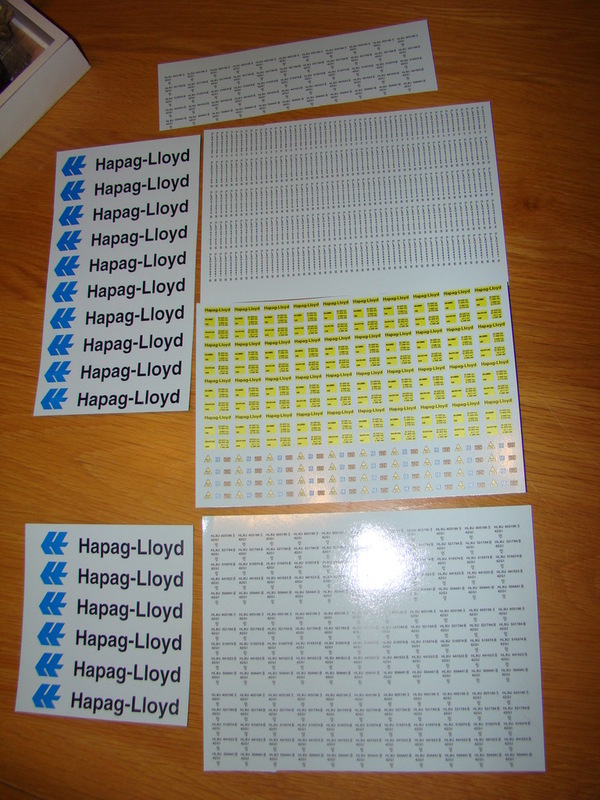 got a lot of decals in today. now to find the time and the pleasure to place them on the models. Well, come on then. 18 hours gone by and not a single decal decorated model has shown up. But seriously, I should think that that is the most satisfying moment, isn't it Thijs, when you can hold the truck up and say DONE! Looking forward to seeing the results. Are these from your usual decal maker? Yes,he stil made them for me,but also with mistakes. some he have to do over,and some because i was forgotten to mention it. i cleued 1 side (part) of of 1 cab,just to try,but it was already after 12pm at night. todat i help with the removal of my sister in law house furniture,so did not much eather. besides spraying the tv screen holder (http://www.captainsvoyage-forum.com/...cruiser/page20) and the ducks pedestal with a matt varnish. and even that went wrong,even from bad to worst. 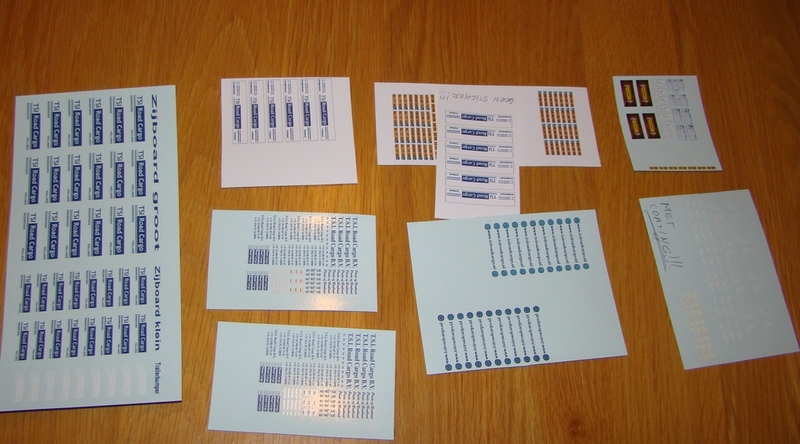 but i wil try to decal 1 of every model,so i will know if everything fitts. If some of the decals are OK, you can get on with them. If it goes well, then at least that's something good, Thijs. It's very disappointing, though, when you sit down to do a job and then find the bits are wrong. And it's a shame about the varnishing but, knowing you, you'll sort it out. 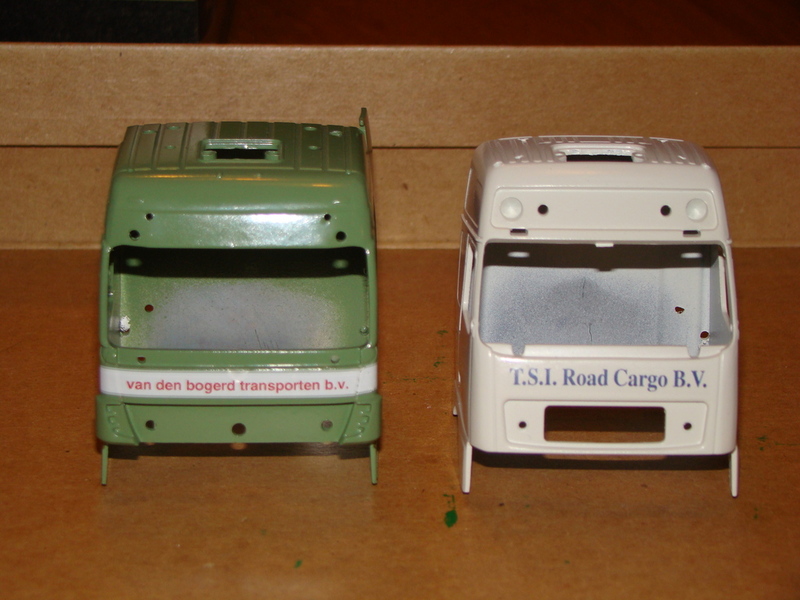 placed some decals this evening,i had beter decals for placing,those are not working so nice.those on the green cab. Not quite sure what you mean, Thijs. Is it that you are not happy with the decal on the green cab in the first pic.? It's hard to see in a photo, but they all look fine to me. I like the bt logo, it's smart and clear. 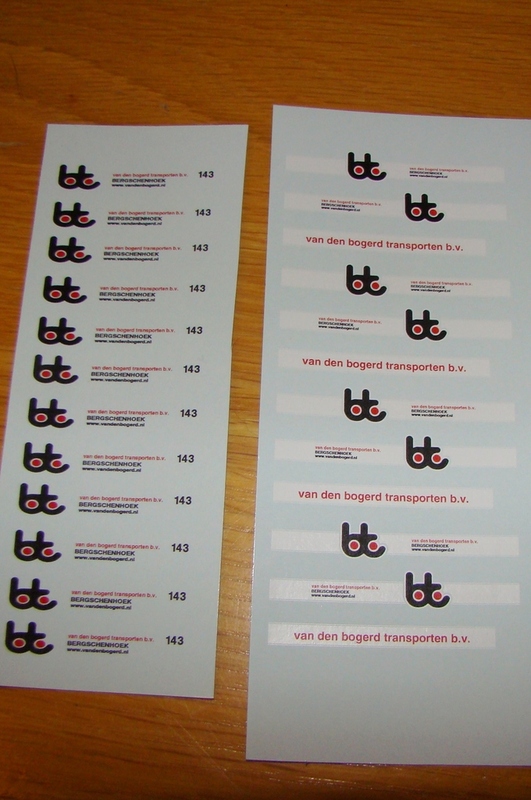 no ,how the decals look is oke,but to work with them. i had decals which are not so sticky after placing,so time left to place them right in a few tries,but now they stick right away,and wil come diffecult loose to remove them. they aslo slide not so easy from the paper. 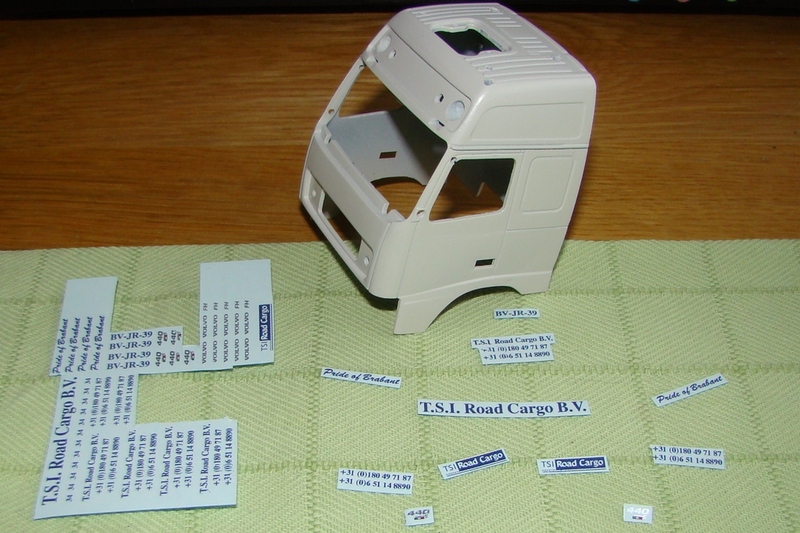 al the decals cut out for 1 cab,the only part that's missing is the decal for above the frontwindow in the lightbox. 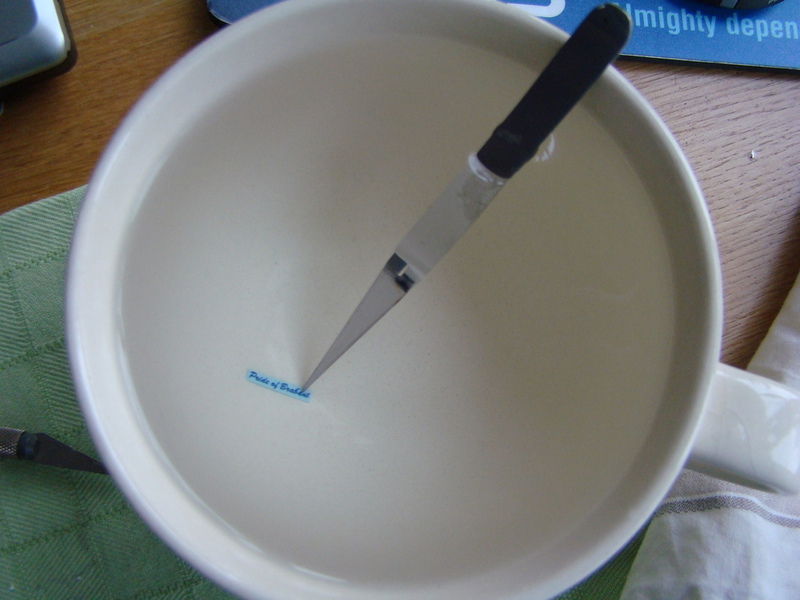 pick 1 decal in a pinchet,and place that for a few seconds or a minute in a bowl hot water,to release it from the paper. slide it a little from the back,and place it on the cab,and remove the paper,the decal wil stick on the cab. by making the cab wet you can correct it's position,press it down,and done. and after a while i have 2 cabs decaled. Last edited by janihudi; January 19th, 2014, 21:46. 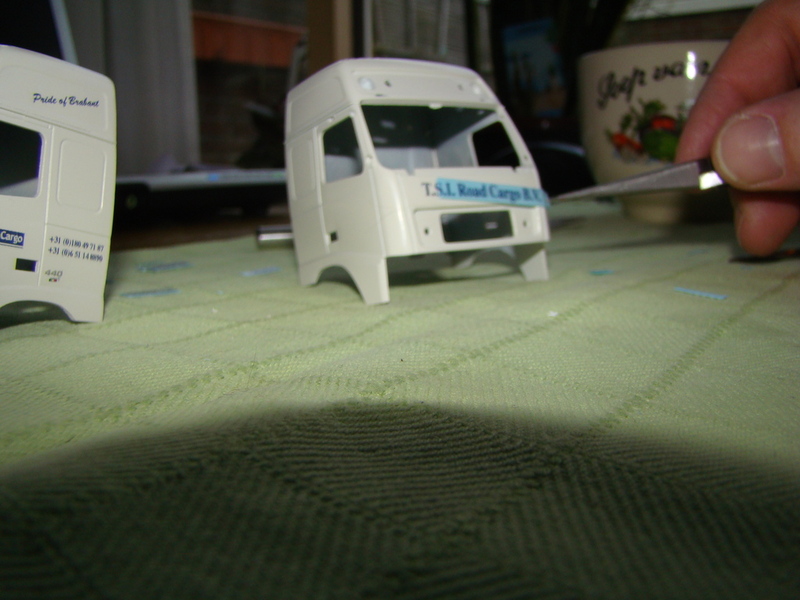 Great idea to moisten the cab before you place the decal on, so that you have time to get it exactly right. Looking good, eh?